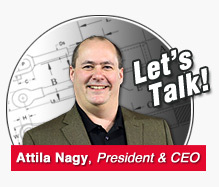 Wire ropes are manufactured in a great variety of constructions to meet the varying demands of wire rope usage. Where abrasion is an important factor, the rope must be made of a coarse construction containing relatively large outer wires. In other cases, the great amount of bending to which the rope is subjected is more important. Here, a more flexible construction, containing many relatively small wires, is required. In either case, however, if the rope operates over inadequate size sheaves, the severe bending stresses imposed will cause the wires to break from fatigue, even though actual wear is slight. The smaller the diameter of the sheave, the sooner these fatigue breaks will occur and the shorter rope life becomes. Another undesirable effect of small sheaves is accelerated wear of both rope and sheave groove. The pressure per unit area of rope on sheave groove for a given load is inversely proportional to the size of the sheave. In other words, the smaller the sheave the greater the rope pressure per unit area on the groove. Both sheaves and rope life can be prolonged by using the proper diameter sheave for the size and construction of rope. Sheave diameter also can influence rope strength. When a wire rope is bent around a sheave, there is a loss of effective strength due to the inability of the individual strands and wires to adjust themselves entirely to their changed position. 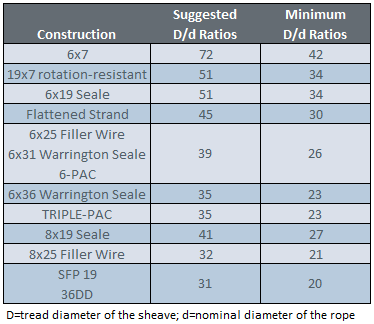 Tests show that rope strength efficiency decreases to a marked degree as the sheave diameter is reduced with respect to the diameter of the rope. A definite relationship exists between rope service and sheave size. As a guide to users, wire rope manufacturers have established standards for sheave sizes to be used with various rope constructions.